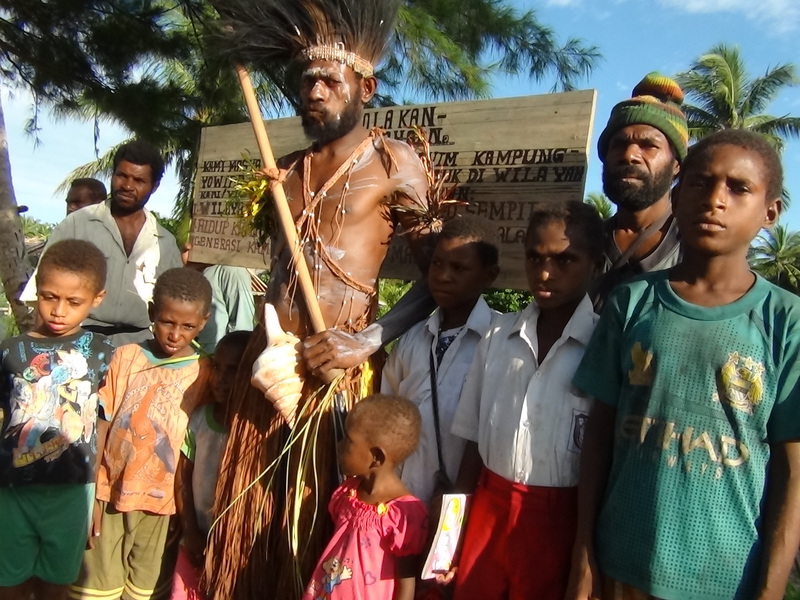 Throughout Merauke Regency in the southern part of West Papua, a land controversially annexed by Indonesia 50 years ago, indigenous communities are having to learn fast how to resist corporate manipulations. In 2009 ambitious local politicians proposed Merauke as Indonesia’s new center for industrialized agricultural growth. This was in the aftermath of the 2008 global food crisis, when governments worldwide got preoccupied about national food security, prompting a wave of land-grabbing globally. The Merauke Integrated Food and Energy Estate (MIFEE), as it became known, was officially launched three years ago in August 2010. Around 50 provisional permits have been issued to around 20 corporate groups, mostly from Indonesia or South Korea. Fear and conflict is only ever one step behind the company. Back in Yowied, company guards working for PT Mayora, the company which is trying to gain access to plant sugar-cane, accused people of being separatist rebels, fighting for West Papuan independence. Seeing that villagers were preparing to run to the forest in fear, some community leaders felt forced to sign a document PT Mayora were presenting them. In nearby Woboyu, villagers were scared a deadly conflict would break out after rumors spread that people from another village were collaborating with PT Astra to survey customary land boundaries. Both companies are planning sugar-cane plantations. The SSUMAWOMA Forum is a group that has emerged in recent months, made up mostly of university graduates who have roots in the western part of Merauke Regency. With the backing of the communities, they are articulating their opposition to all plantation plans, at least as long as the people lack the skills or experience to get meaningful employment with companies, meaning they end up marginalized on their own land. They bring the voice of the villagers to the public and government, showing how the people have nothing to gain from plantations and, at the same time, have so much to lose: their forest, their livelihood, their culture and their identity. In the eastern part of Merauke is the border with Papua New Guinea. The area is militarized, under the pretext of protecting the border zone. For decades local people have had to live with constant intimidation from the troops at dozens of outposts strung along the border. Here traditional society has faced even more challenges; many women have been raped, and subsistence becomes more difficult when military personnel have hunted many of the forest animals.